North Carolina-based Puppeteer Tarish 'Jeghetto' Pipkins makes his Boston Debut this November with an interdisciplinary residency and a performance of 'Just Another Lynching: An American Horror Story' at Puppet Showplace Theater. Puppeteer Tarish 'Jeghetto' Pipkins joins forces with a cast of Boston-based puppeteers to confront haunting truths about our country's past, present, and future. Just Another Lynching is a puppet show that dives deep into the culture of racism and oppression during the Jim Crow era in the United States. Audiences experience the tale of a man who loved his family, but who nevertheless met an unfortunate end at the hands of racism. Framed as one man's eulogy to his lost childhood friend, the play unfolds as a series of touching memories that refuse to be ignored or mis-remembered. 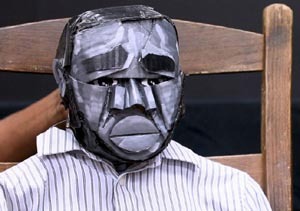 Jeghetto's ghostly, large-scale puppets combine with extraordinary sound and projections, creating a space where contemporary audiences can reflect, bear witness, and engage in radical honesty. The performance will be followed by an open discussion between Jeghetto, the community, and the creative team. Jeghetto is a self-taught, interdisciplinary artist whose work has been featured in Missy Elliott's Where They From music video, in performance at the Chicago International Puppet Theater Festival, and at Blackspace, an Afrofuturism arts collective an makerspace in Durham North Carolina.